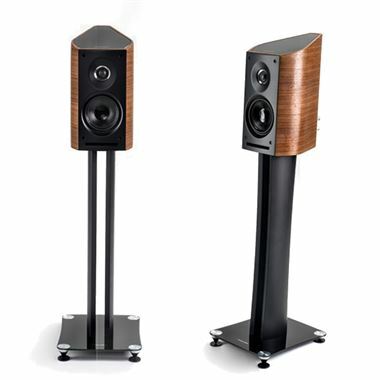 Ex Display Sonus Faber Venere 1.5 Speakers with matching stands (worth £398). Available with Free Delivery. The Sonus Faber Venere 1.5 is a bookshelf speaker with its own (optional) stand and characterised, like all models in the entire line, by the Lyre shape. Also for this model, the particular construction of the cabinet, a tribute to our flagship Aida, provides a solution to the problem of internal spurious resonance and gives a rear aerodynamic profile which prevents criticality with the wall behind the speaker. The front positioning of the reflex conduct makes placement in the environment even easier and enhances the potential of the drivers (one mid-woofer with a Curv™ cone and a 29mm tweeter with silk dome created by DKM) thus generating sound that is fresh, fast and always very exciting. The sloping front baffle, featuring curved guides, allows for perfect timing and effective 'dialogue' between the drivers, always ensuring an enthralling listening experience. Particular attention was given to the stand, with a tempered glass base and its adjustable aluminium feet, it confirms its belonging to the Venere family, providing fluidity of style but also functionality: the feet allow for the effective coupling to the floor, producing sound that is even cleaner and more vivid. This 2 way, like all members of the Venere family, is easy to use and suitable for placement in a variety of 2 channel, multi-channel or home theatre environments. Tweeter: 9 mm high definition precoated fabric dome driver with no ferrofluid. Sonus faber design. Mid-woofer: 1x150 mm driver. Free compressionbasket design and Curv cone. Ultra dynamic performance and linearity. Sonus faber design.